As an ever-growing migrant caravan approaches the United States border from Central America, liberals and conservatives naturally disagree on what to do once they arrive. Open-border liberals typically want to simply let them in, no strings attached, although many aren’t saying it too loudly right now for fear of losing midterm voters. Conservatives on the other hand, while generally opposed and in the process of enjoying a PR spike driven by images of countless mostly military-age males marching toward our border carrying – invasion-style – from the countries they just left, are at a loss at what to do once this mass of people actually hits the United States-Mexico border in a few weeks. To make matters worse regarding how the United States public views this migrant caravan, the vast majority of migrants reportedly just turned down Mexico’s offer to grant refugee status that would have provided jobs, schooling, shelter, and medical care. Of course, the “jobs” part might have been a stickler. Interestingly, under Mexican President Enrique Pena Nieto’s “You Are In Your Home” program, migrants would have been required to work in various areas of that nation’s infrastructure repair in order to obtain the “freebies” Mexico was offering. Not so in the United States, where the freebies must seem as vast and unending as the Kansas prairie must have seemed to an 1840s wagon train. So, how should our government respond to this latest invasion? Sure, President Trump can and should put the military on the border, but absent Congressional approval means their role will essentially be glorified water-carriers for border patrol agents. Unless the caravan members are carrying weapons and planning to use them, shooting them is obviously a no-go. Repelling them with tear gas, rubber bullets, pressurized water, and other non-lethal means might be effective in the short-term, but it would be a PR disaster, especially since there are at least a few women and children traveling along for cover. 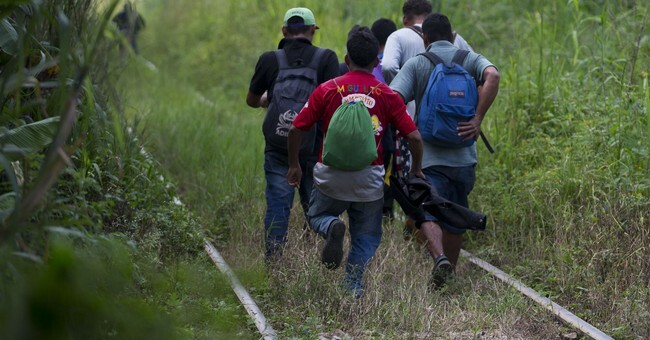 The caravan has shown an inclination to keep moving, regardless of obstacles in their path. What will happen when they encounter a de-fanged military and border agents ill-equipped to handle a group this large? Will they simply walk past them on their way to all the glorious freebies the United States has to provide? I don’t know what WILL happen, but I do know what SHOULD happen, and it starts with our own laws. In June, Teen Vogue ran a story about crimes the U.S. government considers “worse” than illegal entry. They included trespassing on federal land, mailing dentures or your NCAA bracket, and even taking advantage of Smokey the Bear’s likeness. While the folks at Teen Vogue likely wrote the story to hammer the Trump administration for considering the misdemeanor crime of illegally crossing the border a serious thing that good people should be concerned about, they are technically correct. That’s because a first offense of improper entry carries a penalty of a fine or not more than 6 months imprisonment, a slap on the wrist that’s barely enforced. For starters, how about a legal framework that considers border invasion the serious crime it should be? If the migrant caravan members not only understand they aren’t welcome, but that they will actually be prosecuted under a statute that, if convicted, requires a penalty far more serious than a slap on the wrist, perhaps that Mexican asylum offer wouldn’t seem so unreasonable by comparison. The first offense for illegal border entry should carry no less than a two year prison term. A second offense should carry at least a decade, and both should be followed by permanent deportation from this country. For those who say it would be impossible to house so many, just ask former Maricopa County Sheriff Joe Arpaio, who once housed upwards of 2,000 Arizona inmates on a shoestring budget and a few dozen Korean War era tents. He’ll likely tell you, where there’s a will, there’s a way. For those who say a two year prison term is too harsh for crossing the border illegally, consider the societal ramifications – from crime to strains on our infrastructure, social services, healthcare, and welfare systems – that come from a practice that has become all too commonplace. If these migrants know they are walking directly into a waiting prison cell, will they continue their dangerous journey? And for those who do apply properly for asylum and green card status, perhaps putting them to work on OUR disintegrating infrastructure in exchange for any benefits they receive would be a worthwhile move. As President Trump and others have repeatedly said, without borders we have no nation. Which means those who seek to cross our border illegally are essentially attacking our national sovereignty. Such a crime should carry much more of a penalty than a mere slap on the wrist.